There is a counter-narrative emerging in Europe’s approach to irregular migration, even as EU governments seek new ways to discourage desperate journeys across the Central Mediterranean route to Italy. Via the skies over Rome and Paris, other journeys are getting safer, as church groups fly asylum seekers in to claim protection. These safe pathways are the ‘Humanitarian Corridors’, an ecumenical initiative that was established by the Italian church community in late 2015. 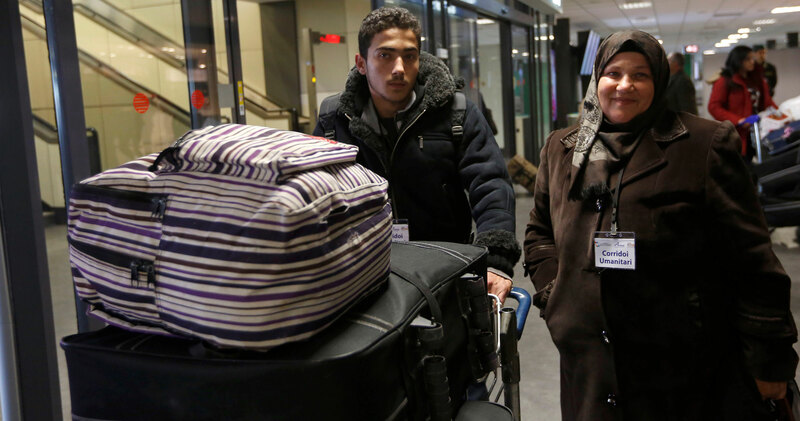 So far about 850 Syrians and Iraqis have been safely flown from Beirut to Rome’s Fiumicino airport, where they lodge applications for refugee status. Then the new arrivals travel on to towns and cities across Italy, where community and parish groups have volunteered to assist them in their new life, providing accommodation, language classes and skills training. Thus far, the vast majority of the asylum seekers have been identified as refugees and the remaining handful granted protection under human rights law. In December 2016, a year after the program began, the Italian government agreed to another church-run corridor, this time for the safe passage of asylum seekers from camps in Ethiopia. The Corridoi Umanitari are gaining support elsewhere in Europe. In France, former President François Hollande signed on in March this year and in early July, under President Emmanuel Macron, the first group of four families landed at Charles de Gaulle airport under the Couloirs Humanitaires. Poland, Spain and Switzerland are also reported to have considered implementing similar initiatives. Flying asylum seekers into Europe seems obvious: it offers an orderly pathway for people with particular vulnerabilities, such as children with serious medical conditions, the elderly, and victims of human trafficking. Security checks are performed at embassies abroad before departure. And the corridors not only provide an outlet for public goodwill, but utilise existing state resources. In France, asylum seekers are flown in on a long-standing but rarely-used humanitarian visa; during the French presidential elections earlier this year, candidate Benoit Hamon called for these visas to be put to greater use for those in humanitarian need. Notably, the Humanitarian Corridors also hold reputational benefits for governments; Italy has claimed credit for the corridors internationally, with its Permanent Representative to the UN, Ambassador Sebastiano Cardi, telling the Security Council that the Italian government is carrying out the program as ‘an act of solidarity and a means to combat trafficking’, and it is ‘a model that other countries are following’. But this is where the story gets complicated. The Italian government doesn’t fund the Corridoi Umanitari, the churches do; the government supports the corridors through conducting security checks and granting visas. And under the original agreement, it limited the church organisations to bringing in 1000 asylum seekers over two years. Meanwhile, the Italian Prime Minister Paolo Gentiloni, who praised the corridors last year as ‘a message to Europe that there is no need of new walls or fences’, is now attempting to place limitations on the work of NGOs operating rescue missions in the Mediterranean. Across the border, the Couloirs Humanitaires is capped at 500 places, a small number for an agreement deliberately signed amid the grandeur of the Elysée, because Hollande called it ‘an initiative that accords with the values ​​of France… [and] recognises the right of asylum… a legal commitment, but also a moral, national and international obligation’. Macron has now suggested that France will set up processing centres to screen asylum seekers in Libya, a plan that Human Rights Watch has said risks human rights abuses. These restrictive measures are evidence that the corridors are not representative of migration policy in Europe. Yet safe pathways for asylum seekers could – and should – be driven by governments rather than relying on the generosity and hard work of civil society. Such mechanisms, like the humanitarian visa in France, have been available in European states before, and arguments have been made at the EU level for their revival. In Australia, similar visa mechanisms already exist but are also under-utilised despite expert recommendations. As Gentiloni said, the corridors can be only part of the solution. And this type of initiative should be used to supplement, and not replace, other avenues to protection. But in today’s migrant crisis, the corridors have proven to be a successful pathway for vulnerable people. Could they be a policy tomorrow? Dr Claire Higgins will be speaking about Italy’s Humanitarian Corridors at Out of Syria, Searching for Safety, on 9 August in Sydney. Ambitions to increase India’s fighter squadrons face complications in local manufacturing, as well the role intended.